and the category-to-position maps just works! N.B. currently, both x and y need to match in order to be considered in the same auto-bin group. This is awesome @etpinard, so much fun to play with! I'll not 100% convinced the scaleanchor + matches mock (added in 8c09944) does the right thing. yeah, that one has some problems... looks like after a zoom/pan it manages to satisfy all the constraints (the very shrunken subplots I think are correct), but initially or after an autorange it does not. Here's a more extreme example. Kind of a pathological case, where each subplot has x&y matching, and the x of each subplot is supposed to scale with the y of the previous... this is the case I think compounds height/width differences, so it should be expected that either the first or last subplot gets its data very compressed if you stretch it to a very non-square size. Right now it appears to apply all the scaleanchor constraints, but all the matches constraints except the last are lost. I haven't looked at your code in detail yet, but in order to satisfy this kind of chained constraints seems to me it may be necessary to generate scaleanchor constraints based on each matches constraint (using gs._w and gs._h) and use that to run through the scaleanchor algorithm, and only after that apply the matches constraints explicitly. In that commit, matching autorange:true axes first have their range value computed then we enforce the scaleanchor constraint as if their range was set. This way, only their domain is tweaked during enforceAxisConstraints. I'm not 100% sure this is what users expect, but it seems to make things work ok. I guess it may be clearer that way, as it means “range matches AND scale matches”... just seems weird as the only allowed values of scaleanchor would be ’x’ or nothing. @nicolaskruchten we don't currently match auto-binning for histogram2d traces on the same subplot. At present, I think it would feel weird to add a way to make them match across subplots, but have no way to make them match on the same subplot. I'm thinking we need another histogram2d attribute (e.g. bingroup). Could we split this item into separate issue? Edit: we could also add "shared" (x|y)bins objects in the layout similar to how "shared" color scales/axes will be added shortly. Could we split this item into separate issue? @nicolaskruchten @alexcjohnson would it a big deal if we disallowed simultaneous use of matches and scaleanchor on the same set of axes for this first iteration? In principle that's fine... I would assume that matched totally supersedes scaleanchor anyway, no? In principle you can have both, if you have constrain: 'domain' too. Anyway, I'm fine with omitting it from v1 as long as it's clear we can add it later. Let's have matches win and drop scaleanchor when necessary until they're supported together. Great. Thanks! Sorry for quitting on this problem, but I'll like to get going on sunburst ASAP. on matching axes (which is theoretically possible).
. Let's have matches win and drop scaleanchor when necessary until they're supported together. @plotly/plotly_js this PR is now ready to review 👀 As this PR touches some fairly important cartesian subplot concepts, I'll like both @antoinerg and @archmoj to review this thing. Thanks! 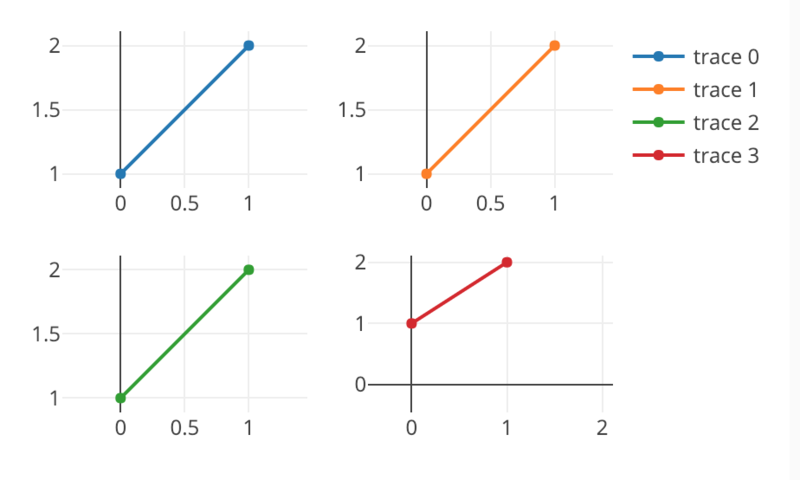 Just to make sure I get the scaleanchor limitations... it means it’s not possible to have two plots with matched axes that are both constrained to be physically square? it means it’s not possible to have two plots with matched axes that are both constrained to be physically square? I think that's totally reasonable to start with! Ping @archmoj @antoinerg can one of you please review this thing today? Thank you. Please find my few comments below. @antoinerg it is a 💃 from my side, if you have no more comments? It is also a 💃 from me! @etpinard eventually I'd be curious to know what hurdles you ran into and how long or hard it woud be to support constrained axes. I'd be curious to know what hurdles you ran into and how long or hard it woud be to support constrained axes.